Novato Park Summer Concert Series Hot Amphitheater Nights: Gather your friends and family, grab your lawn chairs and picnic blankets, and Join Novato Parks & Recreation for this FREE outdoor concert series held at the Hamilton Amphitheater, 601 N. Hamilton Pkwy., Novato. Parking is available at the Hamilton Community Center; 503 S. Palm Dr. and at the Hamilton Old Gym; 115 San Pablo Ave. 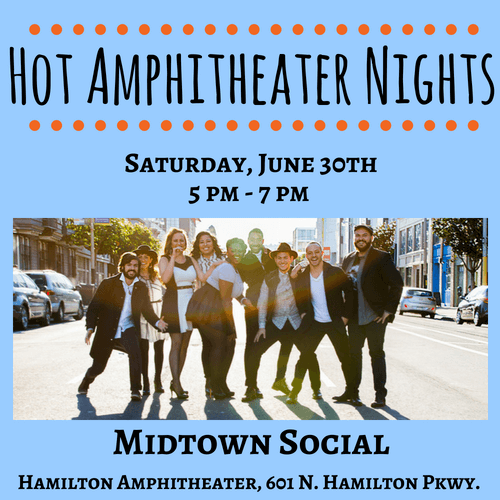 Midtown Social will be playing this summer concert series on Saturday, June 30th. 5pm – 7pm.